We welcome you and would like to offer You to get acquainted with the company-"Tuboplast-Otradnoe." Our new plant, which is located in the Leningrad region, specializes in the manufacture of single layer and multi layer plastic tubes. Today we present to you a new hi-tech production, working on the equipment and raw materials of the leading European manufacturers. 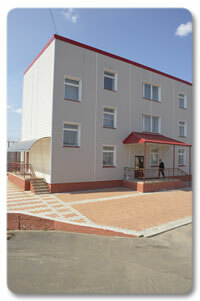 The Company is located 25 kilometers from the center of St. Petersburg near the automobile route St. Petersburg-Moscow. The plant «Tuboplast-Otradnoe» – is an office, a workshop and storage facilities with the space of 3000 square meters and with all modern construction standards. Our plant is a fully automated production plant with ventilation and air conditioning equipment, computer networks, security systems and round-the-clock video surveillance of the production process. OAO “Tuboplast-Otradnoe” is a young and energetic team of managers, talented designers and qualified technical staff with the experience at similar enterprises. The philosophy of our company — Major success is made up from a variety of well thought-out details. Our customers receive prompt and professional assistance in all the stages of projects’ implementation. All of this has allowed us to produce products in Russia on a level of European standards. Among our customers there are such leading cosmetics companies, as: «Red line», «Green Mama», «Cosmetica XXI», «Neva Cosmetics», «Vitex», «Faberlic», «Henkel», etc. The strategy of our company is directed to the rapid build-up of production volumes. Therefore, we are ready for mutually beneficial and fruitful cooperation and we would like to see you among our customers. You could estimate at your true worth the above mentioned possibilities of our production if you visit our company. We are ready to show You the technological capabilities of our company. We can be proud of the fact that for the first time in Russia there appeared an opportunity to realize any requests of customers in the sphere of extrusion tubes’ decoration. Our printing capabilities on extrusion tubes have closely approached the capabilities of the traditional polygraphy. Copyright © 2005 - 2019 Тубопласт-Отрадное производство экструзионных пластиковых туб.